Prepare your peppers for stuffing, remove seeds and ribs. You can cut them in half or just take the tops off to make a whole pepper to stuff. Set aside. In large skillet, drizzle with olive oil in bottom. Heat oil. Saute the onion, garlic and crawfish until the crawfish are done, about 5-8 minutes. Add the Rotel and cook until most of the liquid is absorbed. Taste for seasoning. Add fresh parsley and mix well. Prepare the rice according to the pkg. directions. Mix with crawfish mixture. 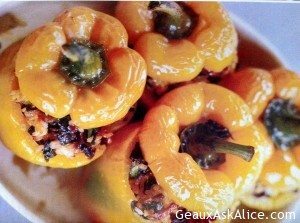 Stuff peppers with the crawfish/rice mixture. Pour the broth in the bottom of a shallow baking dish that will hold the peppers snugly. If using the whole pepper, place the cut top on the top of the pepper. Cover tightly with foil and bake 1 hour and 10 minutes or until peppers are tender. *****If you want to cut cooking time, parboil the peppers. DO NOT OVERCOOK—THEY WILL FALL APART TOO EASILY. Stuff peppers, omit the broth, and just place in baking dish. Cover with foil and just heat in oven at 350 for 12-15 minutes or until hot. You can substitute various rice types. You can change up seafood and use meat or chicken. You can add beans and corn.